There are no strict regulations about what you can, or can’t, wear when paragliding. As you might expect, you can wear layers of “ordinary” clothes, to keep yourself warm up in the sky, or you can buy dedicated one-piece flight suits. Flight suits cause lively debate between paraglider pilots, some of whom believe them to look pretentious. Others regard this attitude as inverse snobbery and think you should be able to wear whatever you like, while paragliding. Like some other sports, the gear you wear affects how other people perceive you, so, it’s up to you, how much you care about that. Below, you’ll learn about some of the clothing items you might buy for paragliding. Although it might give you the air of a fighter pilot, a one-piece suit does offer the primary benefit of not allowing any exposed flesh around your midriff. Thus, you can be confident in being warm during your flight. 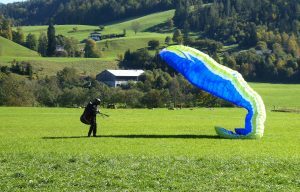 Two-piece flying suits are also available for paragliding. Some people prefer these for their extra versatility, as the items can be worn separately. The top and bottom of the suit may sometimes be zipped together, thus giving the same no-gap benefit in warmth, as a one-piece suit. Paraglider’s shoes are designed specifically for the rigours of the sport. Often, they’ll be lined with Gore-Tex, for its waterproofing and breathability. Lacing is tight, yet easily adjustable, so you get the perfect combination of mobility and comfort. The soles have plenty of traction. You can buy paragliding gloves, with various degrees of protection against rain and cold. Most have extended sleeves to ensure cold air doesn’t penetrate. Breathability means your hands are protected, without becoming wet through evaporated sweat. There are numerous other clothing items you might wear for paragliding, including a fleece, soft shell jacket, pullover, t-shirt or vest. Typically, you’ll layer up with an assortment of these. 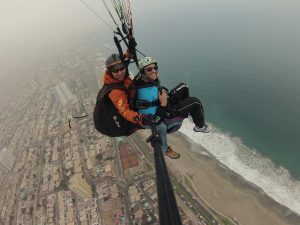 Soft shell jackets are available with paragliding-specific designs. At the very least, they’ll be wind- and water-resistant. Many people wear gear that is intended for other sports, such as ski gloves, ski jackets and hiking or trekking boots. When using hiking boots for paragliding, you should make sure there are no hooks, that are likely to catch your glider lines.